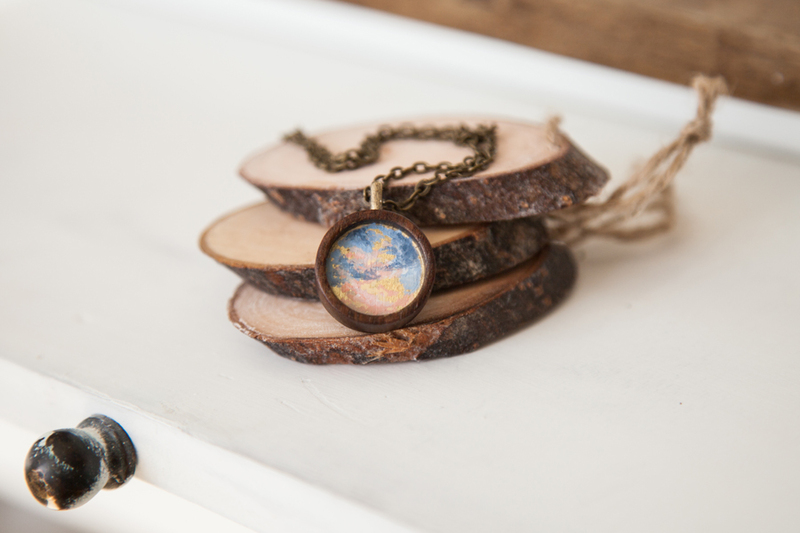 Recently, I fell in love with the idea of little paintings on wood pendants. I found a great source for sustainably sourced wood pendants, and decided to test out how my style would translate - and now I am obsessed and have more pendants coming in the mail! As this year draws close to an end, I am tired and ready for a new year. There is so much that I am thankful for despite the trials and tribulations of this year. But it does not stop me from yearning for more stability in certain areas of our lives. This time of year marks an important anniversary in my life. It has now officially been 14 years since I was diagnosed with Myasthenia Gravis. Some days I continue to grieve the loss of my health. I miss having energy, I miss my body being strong and agile. I miss being able to fold the laundry all at once without having to take breaks. But I haven't gone in to crisis. My husband helps me so much and gives me more grace than I probably deserve (especially on those days where I am truly in the dumps). I let those emotions flood over me, and then I choose to thank the Lord instead of continue down the road of overwhelming defeat. The back of our Christmas card this year is Luke 2:13-14 "Suddenly there was with the angel a multitude of the heavenly host praising God and saying, ' Glory to God in the highest, and on earth, peace, good will toward men'".